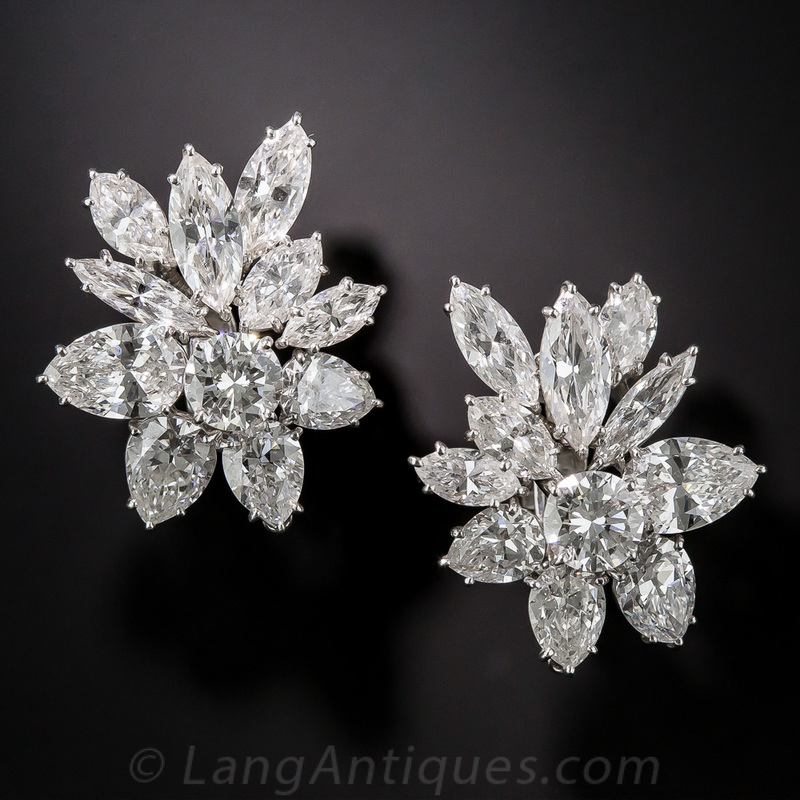 The question most frequently asked of our jewelry experts at Lang is "what is the difference between antique cut and contemporary cut diamonds?" The answer is to be found primarily in the fascinating historical and technological evolution that has taken place at the cutting wheel. For centuries diamond cutters have applied different approaches and techniques, by hand, to the ancient rough crystals that come from the earth. Most of the Lang collection dates from the late 19th century to the middle of the 20th century, a period of time that beautifully encapsulates a range of artful and inventive techniques used to bring out the best in each unique diamond crystal. Unlike contemporary diamond cutting, which primarily uses machines and endeavors to create a reliably identical product on a mass-produced scale, the diamonds of the past differ from those of the present and also from one another. Their captivating subtleties, coupled with their increasing rarity, makes their unique charms highly desirable and sought after. One of the oldest cuts represented in our inventory is the ravishing rose, emerged in the 1500s and named for its resemblance to the flower. 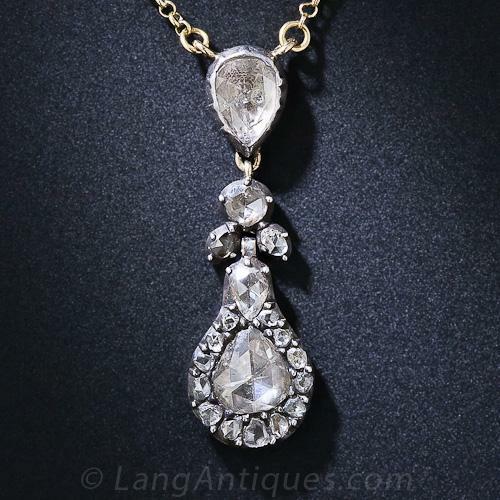 This romantic cut—with a flat bottom, domed top, and as many as 24 facets—was developed in harmony with the shape of rough diamonds and popularized in the Georgian Era. Candlelight filled the homes of 18th century jewelry collectors with the perfect glow to showcase these delightful stones. While they enjoyed a brief resurgence in the Victorian Era, it is only recently that the sparking rose cut has once again caught the eye of contemporary wearers. Though we more often see these beauties set as glittering side stones to enhance a center of another cut, we’re always excited when we do find a ring with a sizeable rose cut stunner! Dating from 18th century Europe, the mine cut, also known as the antique cushion cut, is the precursor to the modern round brilliant cut. But it isn’t actually round at all! 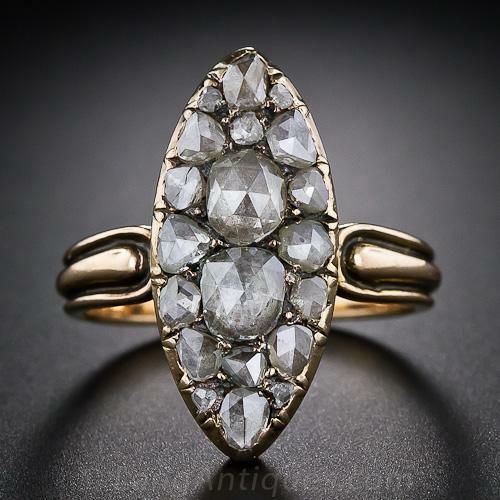 The edges form a soft square or “cushion” shape, resulting in stones that are especially lovely when viewed under the candlelit conditions typical of the 18th to mid-19th centuries, before electricity. 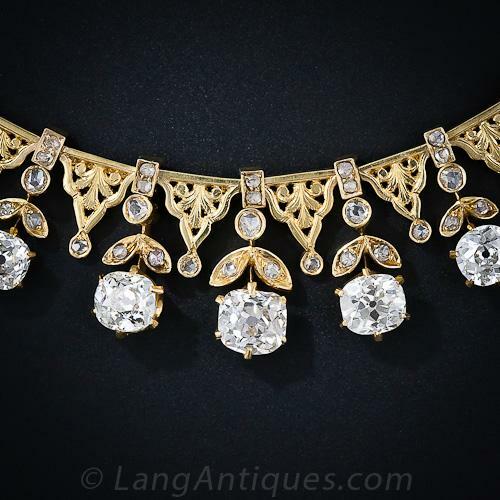 Similar in this way to the rose cut, mine-cut diamonds, though lesser known today, also enjoy a devoted following among antique jewelry lovers. The late 1800s saw a boom of technical innovation in diamond cutting and fine jewelry making alike. 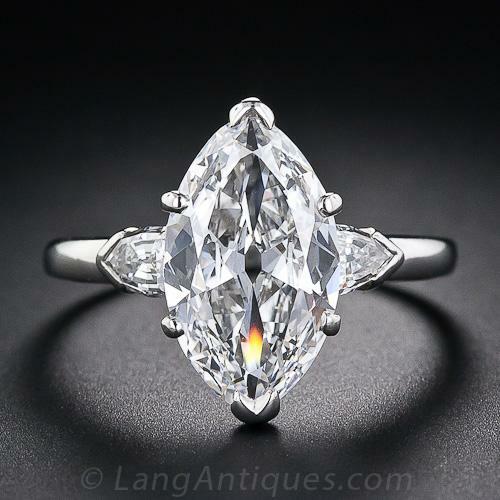 Though older round cuts had existed for some time, the classically beautiful old European cut emerged in the latter half of the 19th century, and remained a finger-dazzling favorite through the first half of the 20th. Around the mid-century they gave way in popularity to the round brilliant cut, and they have characteristics both of this and the older mine cut. 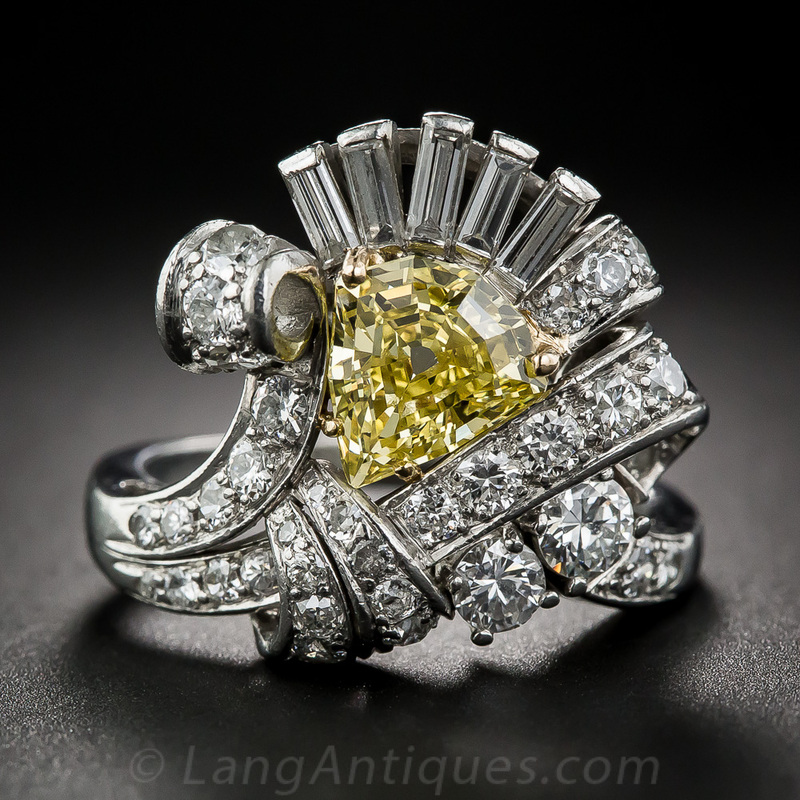 European-cut diamonds are well represented in our inventory, since so many of our original antique and vintage engagement rings date from this period. Many of the rings in our Lang Engagement Collection feature original old European cut stones in vintage-inspired settings as well. 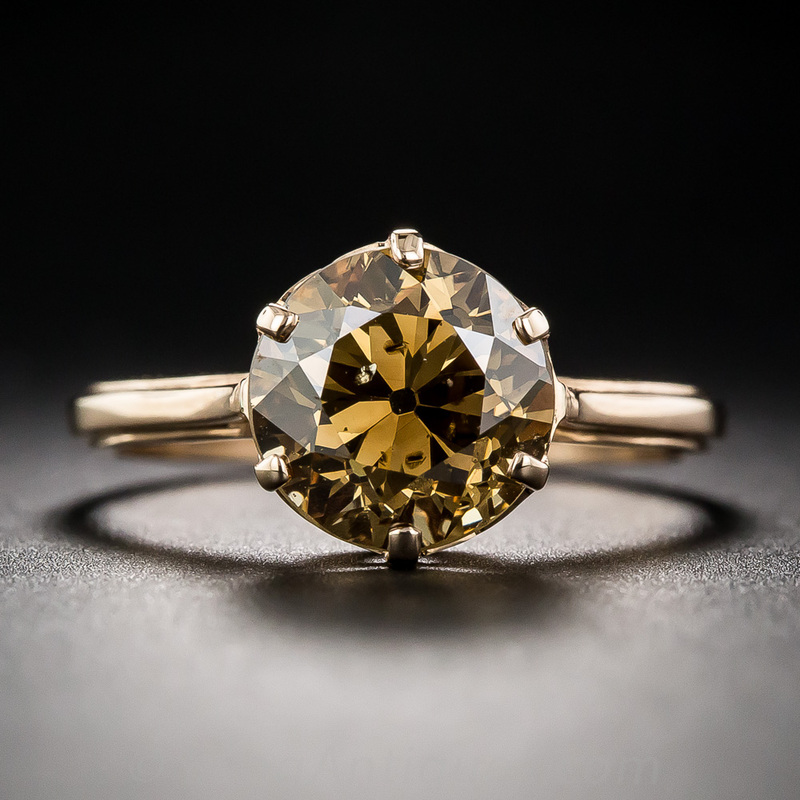 When you fall in love with the subtle radiance and warmth of the stone at the center of a Victorian, Edwardian, or Art Deco engagement ring, it’s very likely to be one of this cut. 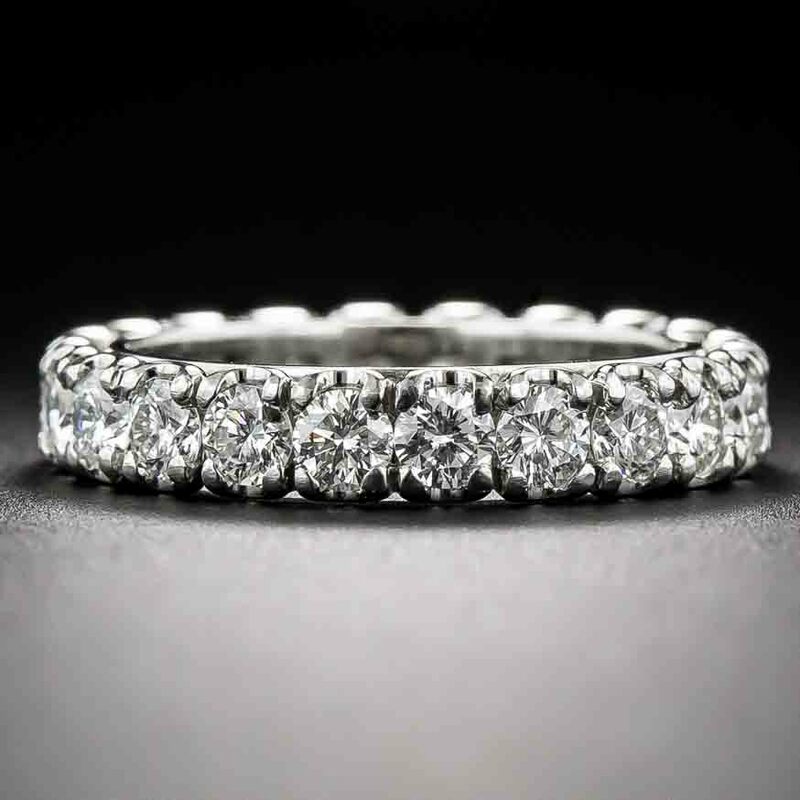 The modern round brilliant cut has become nearly synonymous with the idea of a diamond. Developed in the early 20th century but not widely used in jewelry until the 1940s, today it’s the most popular diamond cut. And we aren’t surprised! 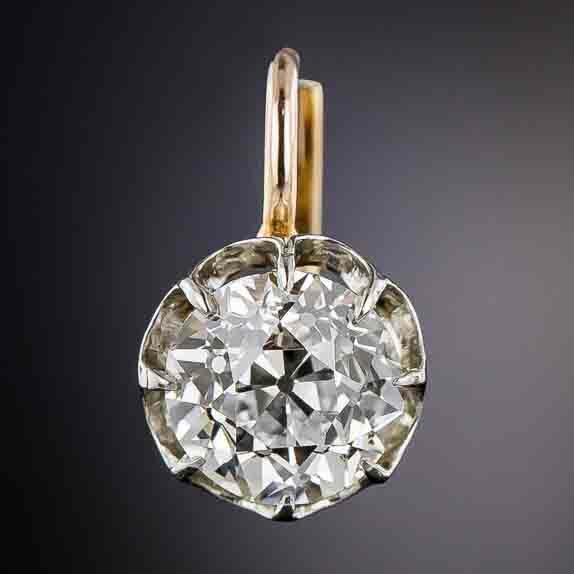 The combination of brilliance (hence the name) and fire seen in the standard round brilliant represents the height of the diamond cutter’s art. 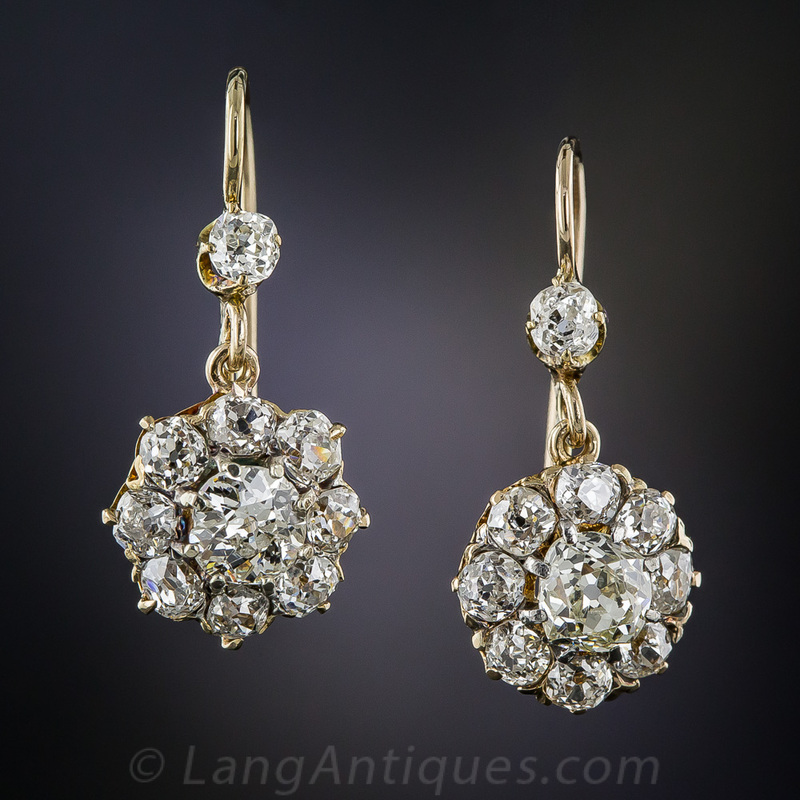 Though our inventory tends to favor the old European cuts of the Edwardian and Art Deco eras, we enjoy mixing in a good selection of these slightly more modern sparklers, which you’ll find among our Retro, Mid-Century, Vintage, and Estate pieces. The brilliant cut is the perfect option for those seeking maximum fire in a vintage or vintage-inspired package. “Fancy” simply refers to any brilliant-cut diamond that isn’t round. These variations have a long history and include many shapes popular as alternative center stones in striking engagement rings: emerald, Asscher, marquise, pear, oval, and “moval”—a hybrid of the marquise and oval shape, to name a few. These stones speak directly to the personality of those who choose them, and tend to result in a “that’s the one!” moment we like to think of as love at first sight. The sophisticated simplicity and tailored lines of the emerald cut, originally intended for the green stone of its namesake, has become increasingly popular for diamond engagement rings. The variety of proportions found in this rectangular step cut gives each stone a character as distinctive as the wearer. Combined with clean geometric facets, the emerald-cut diamond is truly a stone for idealists! As we learned back in elementary school, every square is a rectangle, but not every rectangle is a square! Enter the Asscher, that infinity pool of facets that draws the eye and inevitably leads to the question, what kind of diamond is that…? 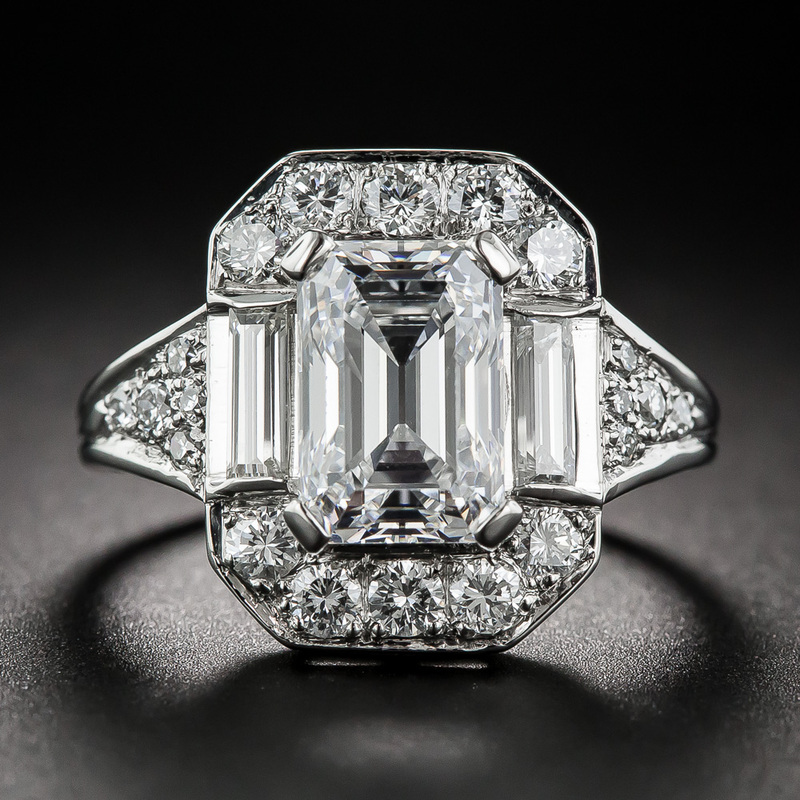 Technically recognized by the GIA as the “square emerald cut,” it gets its popular name from Dutch diamond cutter Joseph Asscher, who developed the cut in 1902. If you love the clean lines of an emerald cut with the symmetry of a round brilliant, this is the one for you. Of course, there’s quite a bit more fascinating detail to the long history of diamond cuts and the way we’ve used diamonds in jewelry—dating all the way back to the Romans, if not further! 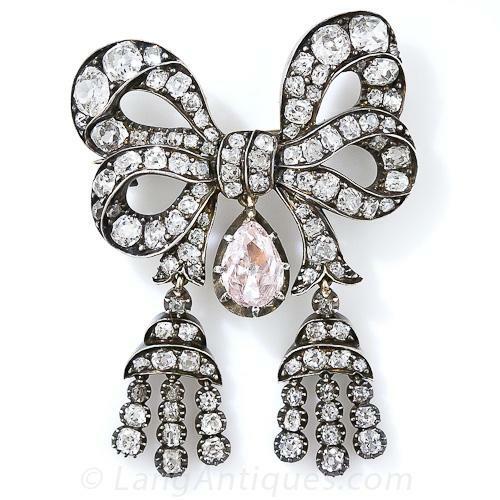 Learn all about it on our sister site, Antique Jewelry University. The popular expression “the 4 Cs” refers to the four most significant factors used to classify diamonds: color, clarity, cut, and carat weight. These four elements combine to determine every diamond’s beauty, rarity, and value. 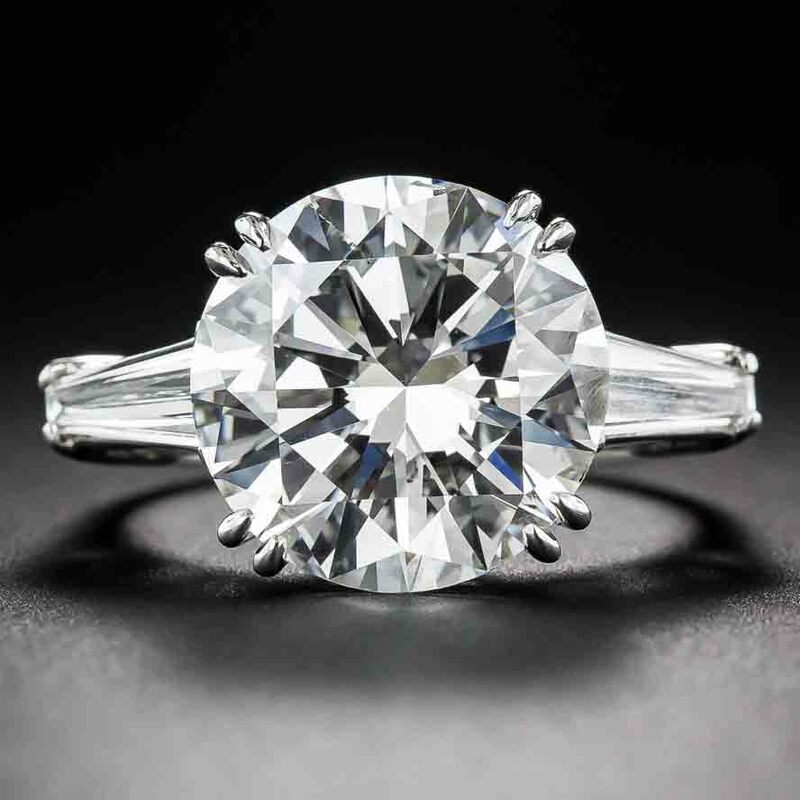 However, when choosing a piece of vintage or antique jewelry, especially an engagement ring, there are other important values to keep in mind—not least of which is sentimental value. 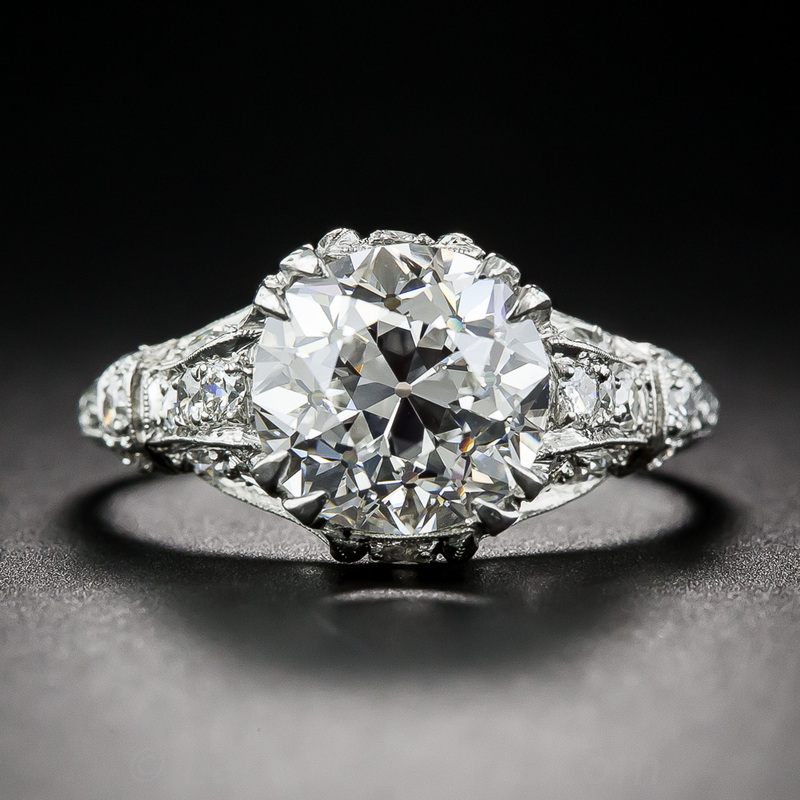 So much more goes into the selection of an antique or vintage engagement ring than the cold, hard facts—countless times we’ve seen an individual or couple fall in love with a ring whose carat weight or color might have eliminated it for consideration with a “just the facts” approach. Both tastes and technology have changed over time—most of our rings were made long before the “4 Cs” were coined…which is not to say that they aren’t important, but simply that they’re only part of the whole picture. Diamonds occur naturally in a wide variety of colors, but the subtle variations in white colorless diamonds, by far the most popular range, led the Gemological Institute of America to create a color scale beginning with the letter D and continuing through the English alphabet to Z. Diamonds with a color higher than Z are considered “fancy colored diamonds.” Fancy colored diamonds come in many different colors and color combinations, and are quite rare. Slightly confusingly, “cut” does not refer to the shape of a diamond (old European, round brilliant, etc. ), but rather to the angles and proportions of facet arrangements, as well as its polished finish and symmetry. The visual elements of the diamond influenced by its cut are brightness, fire, and scintillation. The unit of measurement for diamonds is the “carat,” which refers to a diamond’s weight, not its size. Carats are measured in fractions, with 100 “points” to a carat. For example, one carat is written as 1.00 carat and three-fourths of a carat is written as .75 carat. It is not uncommon for a diamond to appear larger or smaller to the wearer than its actual carat weight, depending on many other factors including the shape and the way in which it is set. So, while carat weight is important to both the value and appearance of the stone, it should not be the sole determining factor when choosing a diamond, especially in an engagement ring. You may find that a stone of technically smaller carat weight has a greater presence on the finger than expected, and vice versa.